Family-friendly attractions include everything from digging into Arizona’s past by going 1,500 feet underground to a turn-of-the-century locomotive (cowboys included)! The Grand Canyon Railway recreates the historic trip by rail to the Grand Canyon, covering 65 miles of classic Old West territory. Trip highlights include a daily Wild West shootout at the 1908 Williams Depot prior to departure, and entertainment and live action aboard the train, featuring roaming western singers, as well as the infamous Cataract Creek Gang. Passengers arrive at the Grand Canyon Depot, located in the heart of Grand Canyon National Park’s historic district, just 200 yards from the edge of the South Rim. Outfitted in hard hat, miner’s headlamp and a yellow slicker, visitors to Bisbee’s Copper Queen Mine Tour will head deep underground and back in time. Tour guides, retired Phelps Dodge employees, lead the group 1,500 feet into the mine and recount mining days, techniques, dangers and drama. 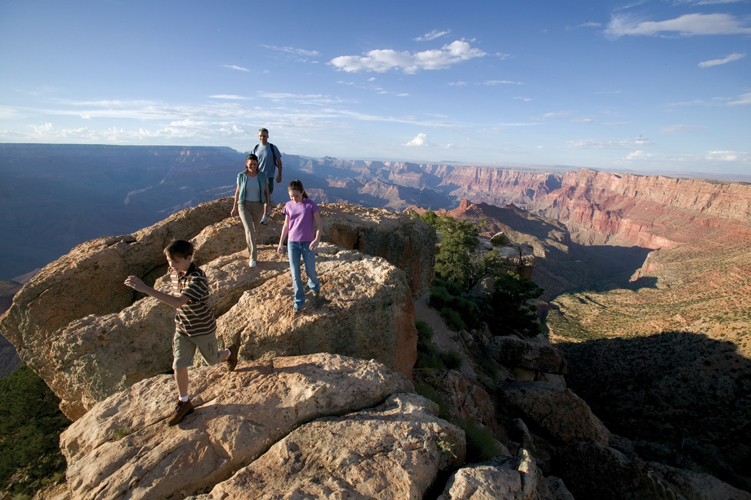 The Grand Canyon State is the prefect place for a family getaway – for kids, parents and even grandparents! Connect with culture, combine family fun & capture the adventuresome spirit of Arizona. Across the vibrant state there are plenty of options to entice families with limitless excursions and fascinating discoveries. From Wild West towns, museums, outdoor activities and more, the Grand Canyon State has it all – the hard part will be deciding where to start. We’ve included some highlights below of various family-friendly attractions and activities available – they’re great for the holiday season, March break or even summer vacation! Check out Arizona’s landscapes, habitat and night sky with outdoor adventures perfect for the whole family! Brilliant colours, the result of natural chemical reactions, plus stalactites, stalagmites and whimsical geologic formations, have been created from hollowed-out limestone rock at Kartchner Caverns. See this stunning “live” limestone cave, which remained undiscovered until 1974, and its wide variety of unique minerals and formations. 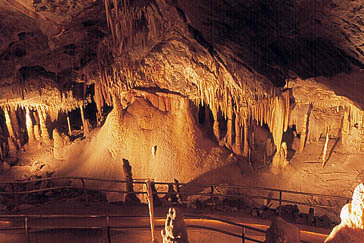 Tour guides will unveil this fascinating underground landscape during a memorable 1.5-hour tour. Celebrate astronomical events at the San Pedro Valley Observatory where visitors will discover a high-quality, educational experience tailored to the individual astronomer. Families can also book a telescope for a family lesson from an astronomer – they tailor the lesson to the family’s needs so it can be as challenging or amateur as needed. The Grand Canyon stands at 277 river miles (446km) long, up to 18 miles (29km) wide, and a mile (1.6km) deep, and is decorated with unique combinations of geological colour and erosional forms. The Grand Canyon National Park (and many other of Arizona’s National Parks) offers various kids’ programs to visitors – from educational programs, a Junior Ranger Program and special summer expeditions. Flagstaff Extreme is a series of exciting outdoor physical challenges. The Tree Top Adventure course is an elevated obstacle course set in the Ponderosa Pines, securely suspended between the trees at 15 to 60 feet off the ground. Features of course include suspended bridges, swings, slides, nets, ziplines and an aerial surf board. The Arizona-Sonoran Desert Museum is actually a zoo featuring the animals found in the Sonoran Desert. Exhibits include rooms full of snakes, a prairie-dog town, enclosures that are home to bighorn sheep and mountain lions, and an aviary full of hummingbirds. Family-friendly museums and tours of historical sites like mines and mining towns offer a great perspective into the history and culture of Arizona – many also offer educational, interactive programs for both kids and adults to enjoy! Founded in 1929, the Heard Museum is dedicated to the sensitive and accurate portrayal of Native arts and cultures. Hands-on galleries offer interactive fun for children, and kids-at-heart, while many of the museum’s events offer unique cultural learning opportunities for parents and children. The Musical Instrument Museum (MIM) offers a shared experience of the history of musical instruments from around two hundred countries and territories in the world. MIM offers various kids’ activities plus education programs and workshops. The Museum of Northern Arizona is Flagstaff’s premier museum to learn about Native cultures, tribal life, natural sciences and arts from the Colorado Plateau region. The museum offers a variety of Discovery Programs throughout the year for all ages plus a number of Heritage Program Festivals that allows visitors to immerse themselves in the cultures of the Colorado Plateau. A rural affiliate of the Smithsonian Institution, the Bisbee Mining & Historical Museum tells about the history of copper mining in Bisbee and the impact of copper in today’s world. Visitors will also learn about the life in Bisbee when it was the largest city between St. Louis and San Francisco. Starting April 17, travelers using San Francisco CityPASS ticket bookleys will have more to celebrate than just huge savings (43 percent off combined admission to the included attractions) and unlimited cable car rides. The 2013 San Francisco CityPASS program boasts two major changes: 1) the addition of the Monterey Bay Aquarium which will share an option ticket with San Francisco’s Aquarium of the Bay; and 2) the reopening of the Exploratorium in its new home on the city’s Embarcadero waterfront. The 2013 pass also covers admission to the California Academy of Sciences, a Blue and Gold Fleet bay cruise, and the de Young and Legion of Honor Museums, as well as a Muni and Cable Car 7-day Passport. Disneyland Resort (Disneyland and Disney California Adventure Park) — Cars Land is an entirely new land that is part of the $1.4 billion Disney recently spent on the transformation and expansion of Disney California Adventure Park. SeaWorld San Diego — Manta is a new launch coaster that dips riders past a manta ray pool and gives them the sensation of actually being a manta ray. Universal Studios Hollywood — Transformers: The Ride — 3-D, an ambitious mega-attraction that features seamless integration of CGI and robotics, as well as one of the most elaborate roaming flight simulator ride systems ever designed. You don’t need a producer, an agent, or even a movie mogul’s budget to visit Hollywood like a VIP. That’s because one quick, easy Hollywood CityPASS ticket booklet purchase gets you into the city’s top-rated Walk of Fame attractions — including a new Tinseltown tour option — at a blockbuster savings of 48 percent. Hollywood CityPASS holders can now opt for 24 hours of unlimited access to the Starline CitySightseeing Hop-on, Hop-off Multilingual City Tour, whose colorful double-decker buses transport visitors from the Hollywood Walk of Fame and Beverly Hills’ Rodeo Drive to the beaches of sunny Santa Monica/Venice and downtown LA. Hollywood. The 2013 pass also includes tickets to Red Line Tours’ “Hollywood Behind-the-Scenes” Tour, Madame Tussauds Hollywood, a choice between the Starline Movie Stars’ Homes Tour or the CitySightseeing Hop-on, Hop-off Tour, and a choice between the Dolby Theatre Guided Tour and The Hollywood Museum. Kemah Boardwalk has been added to the 2013 Houston CityPASS program. In addition to saving 46 percent off combined admission to such top attractions as Space Center Houston (NASA) and the Houston Museum of Natural Science, CityPASS travelers can now choose an All-Day Ride Pass at the Kemah Boardwalk, a sprawling entertainment complex on Galveston Bay packed with rides, midway games, restaurants and live entertainment. And, why not eliminate stress by bundling a CityPASS with a hotel package? Try the Carlsbad, California Hilton Spring Break Package (offered through May 1), with a Southern California CityPASS[DW3] . For $249/night guests can enjoy the amenities at the Hilton Carlsbad Oceanfront Resort & Spa and for $179/night at the Hilton Garden Inn Carlsbad Beach. Enjoy overnight accommodations and breakfast for up to two adults and two children, complimentary use of beach accessories (umbrella, two beach chairs, and four beach towels), 15% off dining and local beach activity discounts, and more! For another great getaway, head to Toronto and explore the city with a Toronto CityPASS. Stay at one of Toronto’s hotels for a Buy 2, Get the 3rd Night Free special. Try the Ritz-Carlton, Toronto for a Family Fun Package where the family can revel in attractions during the day and relax at night with in-room movies, a special kid’s check-in and more! (valid until August 31, 2013). For couples or a girlfriend getaway, An Escape to the Spa is what the doctor ordered! Say goodbye to winter blues while sounded by the tranquility of the Ritz-Carlton Spa. To energize your stay before you see the sights with CityPASS, experience a Bed and Breakfast Package at the Four Seasons Toronto. Experience Toronto’s top attractions while relaxing and enjoying the city’s vibrancy and beauty throughout the spring season. Uncover these packages and more as you embark on your spring travels with CityPASS. When the dog days of summer meet the family, scratch the itch for freedom and take in the wide open spaces of Arizona. Twenty-two Native American Nations across the vibrant state entice families with limitless excursions and fascinating discoveries. Explore the enriching civilizations of the past. Connect with culture and combine family fun to capture the adventuresome spirit of Arizona. Beside colorful high-soaring cliffs of sandstone, beyond small forests of Russian Olive and pine trees, uncover the ancient pueblo ruins of Canyon de Chelly. Reveal the many sights of the sprawling and secluded Navajo Nation by exhilarating jeep-tour across rugged terrain, or canter the canyon and ride horse-back through shallow washes and trails. Home to Natives for thousands of years, the living monument of Canyon de Chelly continues to sustain a community of Navajo people today. Discover artifacts like petro glyphs and dwellings once covered in plaster, constructed of timber, and adobe style bricks. Hike in the shadows of Spider Rock, the sandstone obelisk towering 800 feet above ground also home to the mythical Spider Woman of Navajo stories. The top of Spider Rock is said to be white from the sun-bleached bones of misbehaving Navajo children! Camp-out at Cottonwood Campground and retell tales of Navajo lore, or stay at the nearby lodge. Canyon de Chelly is the perfect place for families to learn about the importance of preserving natural resources, history and culture. Bring your family to marvel at each of the three ancient cliff dwellings on Navajo National Monument. Imagine them as once home to generations of Puebloan families. Constructed of sandstone, mud mortar, and wood, the dwellings known as Keet Seel, Betatakin, and Inscription House are still intact today. Hike the 17 mile trail to Keet Seel for family fitness, get interactive on a guided tour, or walk the shorter trails behind the visitor’s center about a mile long. The educational trails identify indigenous flora and fauna, and display their significance to the Native cultures of the Navajo and Hopi. Overlook the remains of an Ice Age old forest, as the trail leads to the Betatakin dwelling. Learn more while visiting the museum, or overnight outdoors at the campgrounds. Junior Ranger Programs are offered by Navajo National Monument at the visitor’s center. Encourage your wee ones to participate! Along the scenic shores of Lake Powell is the Navajo Nation owned and operated, Antelope Point marina. Boasting a beautiful backdrop and more shoreline to explore than the entire west coast of the U.S, Lake Powell offers a playground of family fun. Splash through the best boating waters by jet-ski, speed boat, or navigate the lake from the comforts of a custom houseboat rental, fully equipped with flat screens, and furnishings. Water slide, cannon- ball, or cast lines for a family catching contest. Go fish- for stripe bass, largemouth, smallmouth, walleye, black crappie and catfish. Antelope Point offers rentals of all varieties, a full service launch, a fishing dock, the world’s largest floating restaurant, and guided tours to nearby Antelope Canyon. The rising and falling sandstone curvatures of Antelope Canyon create gorgeous sloping angles not to be missed. Enjoy the sunshine hitting your family’s faces. Watch the natural light glow through the slot canyon during sunrise or sunset. Time after time Antelope Canyon creates amazing photo opportunities….Perfect for a new family portrait! Go your own wake, and make memories to last a lifetime in Page, AZ on Lake Powell. Experience the journey of family life by way of the Navajo. Gain a new perspective from The Explore Navajo Interactive Museum in Tuba City, AZ. Explore many engaging exhibits for children and adults alike. The quadrants of the museum represent the significance of the number four to Navajo culture. Walk in the footsteps of the Natives traveling clockwise from quadrant to quadrant, East, South, West, and North. With every bend experience a new introduction to the land, language, history, culture, and ceremonial life of the Navajo. Whimsy and peace define the Tribal Lands of the Havasupai and their wonderful, cascading, blue-green water-falls. Awaiting your family for an unforgettable adventure, discover the captivating sanctuary of Havasupai Falls. Feel first hand, the spray of what may be the most photographed water-fall of the world, Havasu Falls. Mooney Falls roars as it plunges a thundering 200 feet to the pools beneath its path. Truly an oasis, the five falls can only be accessed by hike, horse, or helicopter. The hike to Havasupai Falls requires a trek of about 10 miles beginning at Hualapai Hilltop, found on the Hualapai Reservation located just north of Peach Springs. Camping and lodging reservations must be made in advance, but are well worth the wait! The trail carves its way down through narrow canyons, steep switchbacks and the village of Supai. Just beyond the village create your home away from home at the campgrounds. Arrive to the campsite and enjoy rewarding R and R after a long haul. Lull to sleep while listening to the sounds of the falls! Peach Springs, AZ, is the tribal capital of the Hualapai, and is a great starting point to the family venture you envision. From here journey the landscape by way of river raft, off-road tour, or hike. Choose the Grand Canyon quest right for you and yours! North of Peach Springs, at Grand Canyon West, visit the SkyWalk at Eagle Point. Walk over the glass bridge, kids and fam hand and hand, while 4,000 feet above the Colorado River. Be sure to keep close, while looking to the depths of the canyon below! Translated as “desert people,” The Tohono O’odham Tribal Lands are located in southern Arizona. With wonderful mountains and gorgeous starry skies, the Tohono O’odham Nation, offers a wealth of family friendly explorations. Among these mountain ranges find the sacred Baboquivari Peak and Kitt Peak, both of which are sacred to the O’odham. Vistas and starry skies from these vantage points can be compared to no other. Admire the Milky Way, share dreams, and remember to shoot for the stars! View the same stars so significant to Native American culture through special viewing programs at Kitt Peak National Observatory. The observatory has the greatest number of telescopes in the world! Resorts upon our Native Lands in Phoenix and the surrounding valley provide great getaways, summer winter fall or spring! From golf, and five-star dining, to horseback riding, cultural centers, spas and shopping, what more could the modern family want? Chandler, AZ offers The Sheraton Wild Horse Pass Resort & Spa, on the Gila River Indian Community. Featuring three swimming pools, and a waterslide over 100 feet tall, stay cool poolside. Create a cannonball contest or rest afloat during a “dive-in” movie on the big screen! The Radisson Fort McDowell Resort of Fountain Hills is another great stay for strengthening family ties. Surrounded by the Sonoran desert the tribe offers cowboy games, adventures for kids and championship golf at We-Ko-Pa Golf Club. Talking Stick Resort, on the eastern border of Scottsdale, highlights a collection of postmodern art including pieces by artists of Native American descent. Experience tribal culture and Wild West wonder during a resort stay with attractions for every member of your family. And who says pooches aren’t people too? Bring even your best friend along to the doggie friendly Radisson and Sheraton resorts. If shoveling all winter long leaves you longing for a way to enjoy the slosh and snow, visit Sunrise Mountain. A wonderful place for a wintertime wilderness retreat, Sunrise is located in the White Mountains on the Apache Reservation. Get cozy and share stories fireside at the lodge. Benefit from some of the best skiing in the Western U.S! Welcoming all levels and types of expertise the mountain has 65 ski runs, as well as separate snowboarding, and bunny runs. Snowmobiling, cross country skiing, hunting, hiking, ice fishing, sledding and sleigh rides make Sunrise a recreational paradise and the perfect place to get active when it’s cold outside. Summertime in Sunrise offers just as much to enjoy with a marina and full service boat dock on Sunrise Lake. With plentiful Rainbow, Brook, and Apache Trout, the lake is a premier fishing destination. 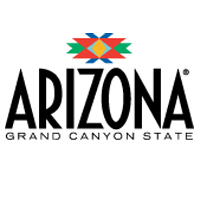 Arizona, Events, Music, Places to Travel, U.S.A. In a celebration of local, independent flavors, Crave Arizona is a culinary experience presented by Savor Scottsdale, an alliance of more than 20 unique Scottsdale area restaurants. On January 28, 6:00 p.m. at The Chef’s Loft on SouthBridge, experts battle it out in a battle of the sexes blind wine tasting challenge. All guests can join the adventure as they sniff the beautiful aromas then savor the eccentric flavors while sipping through the same selected bouquets with the experts. Please visit Crave Arizona for tickets and more information. Begin a weekend of romance at the Desert Botanical Garden with a candlelit outdoor concert under starry skies. Enjoy cocktails at the cash bar, try a wine flight or purchase wine or champagne by the bottle. Arizona’s longest running art festival, showcases the work of hundreds of visiting artists, craft persons and musicians from around the country, horse-drawn trolleys, roving entertainers and a food court. Visit Tubac Festival for more information. The 11th Annual Strong Beer Festival features a wide variety of beers from Arizona and guest breweries around the southwest and California with an array of types and styles for tasting. Please visit Arizona Craft Brewers for more information. With every New Year brings excitement; the return of your favorite annual events, fresh beginnings and new endeavors for some. This year welcomes back Wings over Willcox, the annual birding and nature festival, the Phoenix Strong Beer Festival and Scottsdale’s Crave Arizona. We welcome the romance of February under a starry sky with Romance in the Garden; a candlelit outdoor concert. Also to celebrate your loved ones, the Annual Chocolate Affair returns to Murphy Park, Glendale. Spend some time with friends, family and romantic partners in the upcoming events this January and February. Join us in a celebration of birds, nature and culture. This year’s 18th Annual Wings over Willcox Birding & Nature Festival includes guided tours and field trips for bird watching, photography, geology, ranching, agriculture, history and more. Also enjoy free seminars, a crafts and trade show, live animal educational booths, workshops, banquet and silent auction. This year’s banquet speaker Scott Weidensaul is the author of more than two dozen books on natural history, including the Pulitzer Prize finalist Living on the Wind, about bird migration, Return to Wild America: A Yearlong Search for the Continent’s Natural Soul, and his newest book, Of a Feather: A Brief History of American Birding. Weidensaul writes for such publications as Audubon, Nature Conservancy and National Wildlife; he lives in the mountains of eastern Pennsylvania, where he studies the migration of owls and hummingbirds. This is a family event so gather up the kids, pack a picnic, fishing poles and join in the great fishing with over 1,000 trout (8 to 17 inches long) stocked in the Tierra Verde Lake for the day. A fishing license is not required for the day of fishing during the tournament published times. Trophies will be awarded to boys and girls 15 and under and 16 and over for the “Shortest Trout”, “Longest Trout” and “Most Trout Caught” during the derby. A fishing license is not needed for the derby; however, a permit will be required for children over 12 years old and adults if you intend to fish after the derby. Licenses can be purchased at the Recreation Center lobby located at 100 S. Old Litchfield Rd. Bring your own equipment and bait. Past derby participants have caught trout using canned corn, salmon eggs, cheese, fish dough and/or lures. Registration opens at 6 a.m. $4 per pole 15 and under; $6 per pole 16 and over, 7 a.m. – 3 p.m. Please visit Litchfield Park for more information. Celebrate Valentine’s Day early at a festival of chocolate & romance with gourmet cuisine and beverage, horse drawn carriage rides, national entertainment and tours of Cerreta’s Candy Company. Chocolate purveyors from Arizona and around the nation gather in Glendale for this award-winning festival, which celebrates not only chocolate, but romance and the arts as well. The Chocolate Affaire is sponsored by Arizona’s famous candy makers, Cerreta’s. The candy factory will offer tours all weekend, so visitors can get a behind-the-scenes look at how the chocolatier creates everyone’s favorite candy. In addition, the festival has become the largest gathering of national romance novelists in the Southwest. This symposium of literary romantics offers fans the opportunity to get up close and personal with authors, as well as the chance to attend free writing workshops given by the experts. Families with children will enjoy myriad activities, including hands-on arts and crafts, face-painting and a rock-climbing wall. Horse-drawn carriage rides will be available throughout the weekend to take couples or families on a scenic, charming ride through the historic Catlin Court district. Please visit Glendale, Arizona for more information. Arizona, California, Events, Music, Places to Travel, U.S.A. The magic of Dr. Seuss’ classic holiday tale as it comes to life on stage, a heart-warming holiday classic. Please visit ASU Gammage for more information. The only Thanksgiving Day Parade in Arizona, featuring local groups and a Grand Marshall. A parade theme is chosen each year. Parade starts at 9 am at the corners of Saguaro and El Lago Boulevards. Fountain Hills and the Fort McDowell Yavapai Nation are home to several major annual events. Please visit Fountain Hills Chamber for more information. Boasting the world’s longest stalactite formation, Kartchner Caverns State Park lets you see Arizona’s tallest natural column formation below ground level, making this state park one of Arizona’s most popular outdoor activities. Located in Southern Arizona, Kartchner Caverns State Park is approximately 55 miles southeast of Tucson, near Benson. Please visit Arizona State Parks for more information. Arizona has the largest percentage of land designated as Native American Tribal land in the United States. Prescott, Arizona is home to the World’s Oldest Rodeo, which dates back to 1888. The only place in the United States where mail is still delivered by mule is in Havasupai, located at the bottom of the Grand Canyon. That familiar chill in the air signals a fast approaching winter and while Canadians love a fresh snowfall, nothing is as cheerful as spending the holidays in shorts and sandals! The Grand Canyon state is busier than ever, with many events sure to excite both locals and visitors, like the First Annual Tubac Ballon Festival featuring seven story tall “gentle giants” glowing like giant light bulbs against the evening sky. For holiday events, watch the states only Thanksgiving Day Parade in Fountain Hills or head out to Lake Havasu City to take in the bright lights of the 28th annual boat parade at the London Bridge Yacht Club. With Arizona’s warm winters, don’t miss out on these amazing outdoor activities and so much more. The First Annual Tubac Balloon Festival promises to be the most exciting event ever to come to Tubac and Southern Arizona. Special shape hot air balloons, like the Bumble Bees and Spiderman, and other seven story tall “gentle giants” glowing like giant light bulbs against the evening sky. There will be an exceptional variety of food and beverage provided by Dos Silos and the Stables Ranch Grill. Enjoy a sit down gourmet meal or visit one of their concessions for your favourite food or beverage. And, the evening will be capped off by the world famous Arizona Skyhawks Parachute Team making a spectacular night time sky dive into the event. Special “glow in the dark” suits and flares add to the visual effect and excitement. Please visit Tubac Ballon Festival for more information. The London Bridge Yacht Club presents the 28th Annual Boat Parade of Lights from December 3 to December 4. Fifty beautifully decorated boats will pass under the historic London Bridge in celebration of the holidays. This year’s theme is Toys on Parade. Lake Havasu’s Boat Parade of Lights has been repeatedly selected as one of the top 100 events in the United States by the American Bus Association. Please visit LHC Boat Parade of Lights for more information. Following the phenomenal success in 2009, US Airways Center is pleased to announce the 2nd Annual Phoenix Tequila Fest, December 11th and 12th from 1 pm – 5pm in downtown Phoenix. Featuring a wide array of añejos, reposados and blancos, attendees of the Phoenix Tequila Fest will be treated to all-day samplings of the finest brands of tequila, from major legendary labels to boutique tequilas distilled in the heart of Mexico. Tastings will showcase distinctive flavors, trends and exotic recipes from a wide array of unique tequila distilleries. This year the Christmas Mariachi Festival will be combined with Phoenix Tequila Fest featuring some of the greatest Mariachis in the world and the finest headliners from Latin America in colourful performances filled with song and dance. Please visit Phoenix Tequila Fest for additional information. Arizona, Events, Places to Travel, U.S.A. The U.S. Travel Association (USTA) recently recognized the Arizona Office of Tourism (AOT) as a leader among state and territory tourism offices by presenting the agency with a prestigious Mercury Award, for the 2010 Arizona Official State Visitors Guide (OSVG) as the Best Print Visitors Guide in the nation. Discovery Park’s Gov Aker Observatory houses the world’s largest known Camera Obscura. More hummingbird species can be found in Sierra Vista, located in the southern portion of the state, than in any other state – earning its title as “the Hummingbird Capital of the United States. Because of its prominent location, dramatic signage and rustic look, the depot is the most-photographed structure in the park, according to the National Park Service. As summer comes to a close and Canadians begin to think about the cool weather ahead, we inevitably also begin daydreaming about our plans for winter trips. Arizona has long been a favourite of Canadians from coast to coast because of its low precipitation levels and high heat. And whether your interests are in large free events like Tempe’s Oktoberfest, yummy tasting events like Tucson’s Culinary Festival, exciting spectator events like Lake Havasu City’s Jet Ski World Finals or the glamour and flash of a film festival like the Scottsdale International Film Festival, there’s always something interesting to do in Arizona. The 38th Annual Oktoberfest at Tempe Town Lake blends polka, bratwurst and beer with salsa and Southwest foods. The event has four beer gardens, two stages of entertainment, German brats and strudel, non-stop polka, local bands and games & entertainment for children. The event is free and runs Fri. 5 pm – midnight, Sat. 10 am – midnight and Sun. 10 am – 6 pm. Please call 480-491-FEST (3378) or visit www.tempeoktoberfest.com for more information. The Scottsdale International Film Festival is rollin’ straight into its 10th season. With 5 OSCAR® contenders in the Festival from the latest Academy Awards you should find yourself very well entertained. Just to put a point on it — there are 27 films from 20 countries including Hollywood Premieres and Indie Arthouse flicks. Also, check out the expanded schedule on Saturday and Sunday mornings AND all the membership benefits, discounts, and 2-for-1 deals. Thank you for supporting the Scottsdale International Film Festival. Roll’em! In its eighth year, The Tucson Culinary Festival is an inspired production of the Tucson Originals, Tucson’s leading group of independent restaurants. The annual four day festival is a kaleidoscope of food, wine, spirits and fun – from sipping ultra premium wine, to chowing down on some of the best barbecue in the country- it’s a locally grown celebration of Tucson’s vibrant culinary scene. The Tucson Culinary Festival is tangible proof that the independent spirit of Tucson is alive and well. The Arizona Office of Tourism (AOT) has launched www.ValueAZ.comin accordance with its annual in-state summer campaign, ValueAz. Although aimed at state residents to generate tax revenue, the newly launched website is open to Canadians as well, providing a one-stop-shop of great travel deals available around the state until September 30, 2010. Cool off like the locals do at Slide Rock State Park! Cool off at a natural rock slide in an area so scenic it has been listed by Life Magazine as one of America’s ten most beautiful swimming holes. Many people don’t consider a trip to Arizona complete without a run down Slide Rock. The world’s largest antique, London Bridge, is located in Lake Havasu City. There is tons to do around the state and so many ways to cool off, including Slide Rock State Park featured on the left column of this newsletter. So visit website www.arizonaguide.com today to plan your next vacation getaway! This exhibition highlights the works of beloved Mexican-born muralist and decorative artist Salvador Corona (1895-1984). Beginning in 1919 following a career as a bullfighter, which ended when his leg was gored, Corona worked artistically in Mexico, Tucson, and other parts of southern Arizona. His murals, easel paintings, and painted furniture graced (in some cases still grace) homes and businesses all over the region, illustrating idyllic pastoral scenes of Mexico’s past. This is the second exhibition in Arizona State Museum’s 2010 Year of Mexico bicentennial and centennial celebrations, and is generously underwritten in part by Marilyn Graham Lawson. Please visit Arizona State Museum for additional information. Take a melodic journey through the world at the Musical Instrument Museum, the first global museum of instruments. The Museum opened April 24, 2010 and showcases cultures from around the globe with more than 12,000 instruments from nearly every country in the world. Transport to another land with wireless headsets and LCD video displays depicting the sounds and sights of the instruments and the people who use them. See the recreation of a gong workshop, listen to the sounds of the traditional Beijing Opera or experience a contemporary Ukrainian wedding procession. If pop culture is more your thing, head to MIM’s Artist Gallery, which houses instruments from famous musicians throughout time including John Lennon, Paul Simon, the Black Eyed Peas and the Jonas Brothers. After enjoying a worldly concert, try out your own musical abilities in MIM’s Experience Gallery, where you can play instruments such as guitars, gongs and drums. The Museum is also hosting concerts in its 299-seat performance hall. Please visit Musical Instrument Museum for additional information. Enjoy Flagstaff’s summer weather and enjoy Movies on the Square, put on by the Flagstaff Downtown Business Alliance. A different movie is produced every Friday night from May to September at Heritage Square in Downtown Flagstaff, AZ. Movies are free and kid-friendly, but enjoyed by all. Live, local entertainment precedes each show starting at 6 pm. Please visit Movies on the Square for more information. Tee for two this father’s day! Tee for two…this Father’s Day! Enoy a family Golf getaway at the Four Seasons Resort Scottsdale at Troon North. This will encourage dads and their kids, to share the love of the game this Father’s Day. Forgo the trite necktie and tacky baubles and give dad what he really wants – quality time with his family. The summer season is fast approaching and Canadians can’t wait to soak up the sunshine and enjoy the outdoors. Canadians continue to travel and take advantage of their strong Canadian dollar. Why wait any longer to enjoy tranquility and fun when you can visit sunny Arizona right now. Whether you are looking for a family vacation, celebrating a milestone or simply deserve a getaway, you will find it here. Be your own boss this summer, and build your own itinerary. – Visit our website www.arizonaguide.com to guide you through the endless travel deals and activities. You’re sure to create memories. Open daily from 7 a.m. to 8 p.m, ( summer hours begin at 7 a.m.), the Desert Botanical Garden hosts one of the world’s best collections of desert foliage. One of only 44 botanical gardens accredited by the American Association of Museums, this one-of-a-kind museum showcases 50 acres of gorgeous outdoor exhibits. Home to 139 rare, threatened and endangered plant species from around the world, the garden welcomes more than 300,000 visitors each year.The garden features interesting activities and exhibis year-round. Jazz in the Garden is an annual spring concert series you don’t want to miss. Spend a warm Friday night with great friends and great music. Throw Papa ON the Train for Father’s Day on June 20th and you’re creating family memories that will be talked about for years. Of course, each father will also receive a special gift as a memento of the day and the journey. Be sure to arrive early so that Dad will have plenty of time to explore the wonders of the John Bell Railroad Museum. The Arizona-Sonora Desert Museum is a world-renowned zoo, natural history museum and botanical garden, all in one place! The museum is recognized as one of the top ten zoos/botanical gardens in the world. The Arizona-Sonora Desert Museum is to inspire people to live in harmony with the natural world by fostering love, appreciation, and understanding of the Sonoran Desert. Enjoy our elegant decor, our highly trained and licensed international staff and the most luxurious and health-restoring treatments and spa products in the Sedona spa. Full service spa with the utmost in personal care! Experience our newly remodeled spa. Rejuvenate in a relaxed atmosphere, receiving attentive individual service and world-class treatments. Take pleasure in a complete range of innovative services from massage to original Desert Treatments and Soul Journeys, as well as facials and nail services. Prices as low as $105.